Pesach used to be considered a time of constipation and ‘bad-food’ but today, we know that Pesach can be a time of ‘great-food’ filled with foods that cleanse, heal and rejuvenate. There are so many ways to use Pesach as a time to revitalize the system—you just need to know how. Carrot juice is the best way to start the day. Carrot juice prevents and relieves constipation. It is important to keep your system flowing freely especially after you eat Matza. Drinking carrot juice first thing in the morning, before you eat is suggested, but you can drink it anytime. Hot water with lemon is a great cleanser for your body. Lemon is a wonderful antioxidant and a great soothing form of vitamin C. Drinking this warm lemon drink throughout the day will also soften your stools. You can add honey to the warm drink if you use honey on Pesach. Almond butter is easy to make and a delightful treat. Almonds are a powerful food with lots of medicinal benefits. Almonds lower the rise in blood sugar, they reduce inflammation in the body by lowering C-reactive protein levels, and the monounsaturated fats and vitamin E in almonds help maintain a healthy heart and cardiovascular system. To make almond butter, lay almonds out on a pan, bake for 45 minutes at 275o. Cool, and then put into a food processer. You do not need to add sugar or oil. The almond will first shred into flour then will congeal into a paste. One of my favorite Pesach snacks is to slice a banana, put a dollop of almond butter on the plate with a drizzle of honey and eat one banana slice with a little almond butter at a time. Wonderful! Turmeric roots are a great addition to Pesach. Turmeric is a root that you can peel and add to your favorite recipes. Add it to soups, chicken, even kugels. It may not be our custom, but remember avocados did not grow in Russia! Turmeric reduces blood pressure and stops the growths of tumors. It is a powerhouse that is antibacterial, anti-inflammatory, anti-allergic and is an anti-oxidant. Researchers are just beginning to recognize the amazing healing qualities of turmeric. Turmeric has been proven effective in treating: Arthritis, cancer, alzheimer’s disease, diabetes, irritable bowel syndrome, indigestion, inflammation, urinary tract infections, gallstones, bronchitis, colds, headaches and diarrhea. 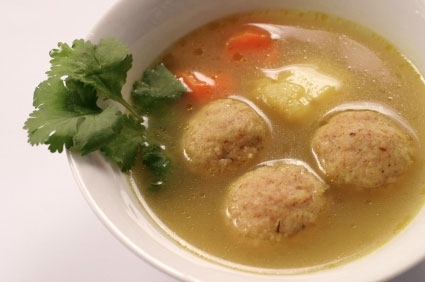 Chicken soup is considered a medicine all over the world. When making your soup, be sure to add lots of vegetables. Adding vegetables like onions, turnips, zucchini and sweet potatoes makes the soup super-healing. When you eat your soup, take a minute to relax. Take a deep breath, exhale, and then sip it slowly breathing in the vapors and allowing the soup to heal your body. Horseradish is world renowned for its healing properties. Horseradish is considered a super-food. The Glucosinolates found in horseradish are responsible for the hot taste of horseradish, and a recent study from the University of Illinois indicates that the substantial quantities of glucosinolates in horseradish can increase human resistance to cancer. Horseradish is a natural antibiotic and a powerful antioxidant. Studies have shown that horseradish root helps with sinus infections. So don’t just eat horseradish at the Seder. Add it to your salads, meat dishes and soups. Make this Pesach a spiritual and physical time for growth and healing. You do not need to feel full and uncomfortable; you need to feel stronger, wiser and joyful. Sara Chana, IBCLC, RH (AHG) is a lactation consultant, classical homeopath, registered herbalist, doula and mother of seven children. She has worked with over 10,000 new moms and babies. Please like her Facebook page Sara Chana and/or follow her on twitter. On May 1st she will be launching her Breastfeeding App with 102 original videos at www.sarachana.com!